Wondering if you have an Eating Disorder or looking for Eating Disorder Help in Toronto? We provide services in Toronto aimed at mental health and wellness, ranging from individual psychotherapy and groups to self-empowering personal growth and development workshops. Click to learn more. 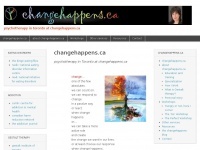 A profile of Changehappens.ca was found on the social network Twitter. The web server used by Changehappens.ca is run by The Endurance International Group and is located in Burlington, USA. On this web server 17 other websites are hosted. The language of those websites is mostly english. The Changehappens.ca websites were developed using the programming language PHP and served by a Apache server. For managing the data of the webpages the CMS WordPress in the version 5.0.4 is used. The website uses the latest markup standard HTML 5. The website does not specify details about the inclusion of its content in search engines. For this reason the content will be included by search engines.